Not everyone loves to exercise….we understand! At Rivercity Pilates we tailor our individual sessions and group classes to the “every day” person ( you know…the average person who just wants to exercise so they can feel better in their body, avoid injuries and keep up with life’s activities). Our goal is to create an environment that you love so much, you almost forget you are exercising!! If you’ve never practiced mindful movement like Pilates or Yoga before…we would love nothing more than to be the place you start your practice! Our trained instructors will teach you how to individualize exercises to your unique body, you’ll be educated on how movement can be a health tool in your life and most importantly your time at the studio will help your body feel amazing and ready to take on whatever life throws your way! All of our teachers are trained not only in the exercise method but in how to adapt exercises to different bodies. This means you can be sure that the exercises you are being taught are safe no matter what is going on in your body or what level of fitness you are starting at! Our classes are small. Most classes range from 4-8 people maximum. Small classes means your instructor knows you, tailors exercises to you and you don’t get lost in the crowd… Your instructor is always making sure you are doing exercises safely and your instructor is able to give you feedback on how you can make each exercise more effective. We offer a variety of group classes at a variety of times and have instructors available for private training sessions just about any time of day. This means even with your busy schedule you’ll be able to find times to get to the studio and get your workouts in! Exercises are functional, safe and progressive. Our goal is to help you get stronger, more mobile, more flexible and more balanced in your body. We don’t believe you need to do crazy acrobatic feats to be healthy and in shape for your life. We want you to learn how to move better and feel better and we do that as simply as possible! Empower your Body ~ Inspire your Life. …. that’s our tagline and it’s our passion! Our Rivercity Pilates staff really believes that mindful movement can teach you to empower your body, inspiring you to live your best healthiest life! 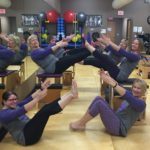 Rivercity Pilates offers sessions and classes utilizing the Pilates Equipment, Pilates Mat Classes, Yoga classes , Barre classes, classes specializing in self care methods like rolling and other specialty mind body exercise classes. We also have a beautiful massage room where you can book a relaxing Massage! Rivercity Pilates is also a Pilates teacher training studio. We offer a comprehensive classical Pilates teacher training program and a Pilates mat teacher training program. 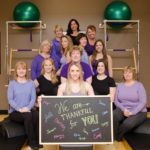 Regular Studio Hours: Sessions are available daily by appointment from 7 a.m. – 8 p.m.
Rivercity Pilates is located right off of Highway 965 in North Liberty. Take exit 240 for Coral Ridge Ave/IA-965 toward North Liberty/US-6. Take 27th Ave/Coral Ridge Ave/IA-965 North towards North Liberty away from the mall. Continue to follow 27th Ave/IA-965 into North Liberty. Turn right at Ashley Court. Turn Left on Jordan Street and you will find Rivercity Pilates in the building at the end of the road. Travel south on IA-965 to Ashley Court. Take a left on Ashley Court. Turn Left on Jordan Street and you will find Rivercity Pilates in the building at the end of the road.